We were sad to leave the Amalfi Coast behind, we had loved our couple of days in the sun, but were very excited to get to Rome. We got onto the coast road earlier this time and it was much easier to navigate without traffic. 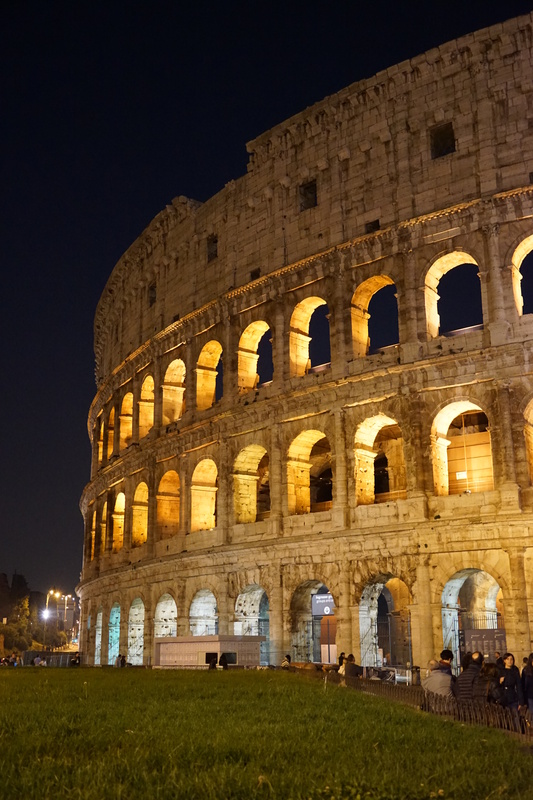 We had decided not to take the car into the city in Rome and instead booked parking at Ciampino Airport which is half an hour out of the city. We had read about how intense driving was in the city centre and also parking prices were extortionate at hotels in central areas (30Euros+ a night) for 20Eu we could park the car for 4 nights and return shuttle tickets from the airport were only 8Eu each. It was super easy and definitely the right option for us, plus it allowed us to get a giant apartment right in the centre of the city on AirBnB, once we didn’t have to worry about parking we had way more options and they were much cheaper. More money for activities! 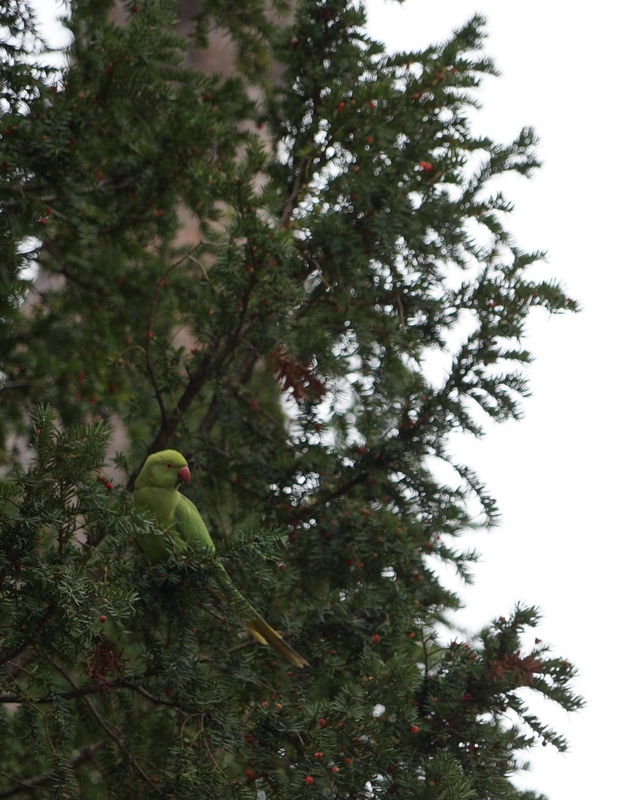 It was starting to get dark by the time we settled into our apartment but we decided to head out and explore anyway! 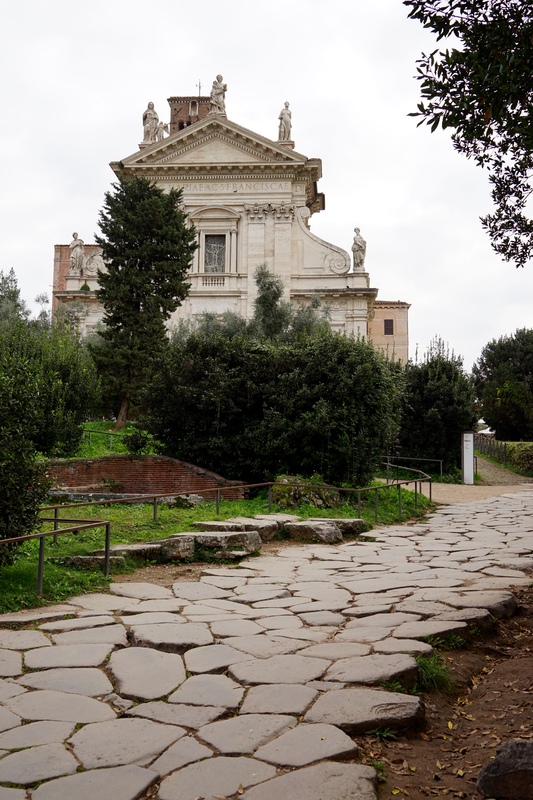 (It starts getting dark at 4:30pm over here approaching winter) Thanks to our central location we only had to walk around the corner to find our first Roman ruins, we recognised these as a filming location from the Man from UNCLE movie we’d watched in Edinburgh. 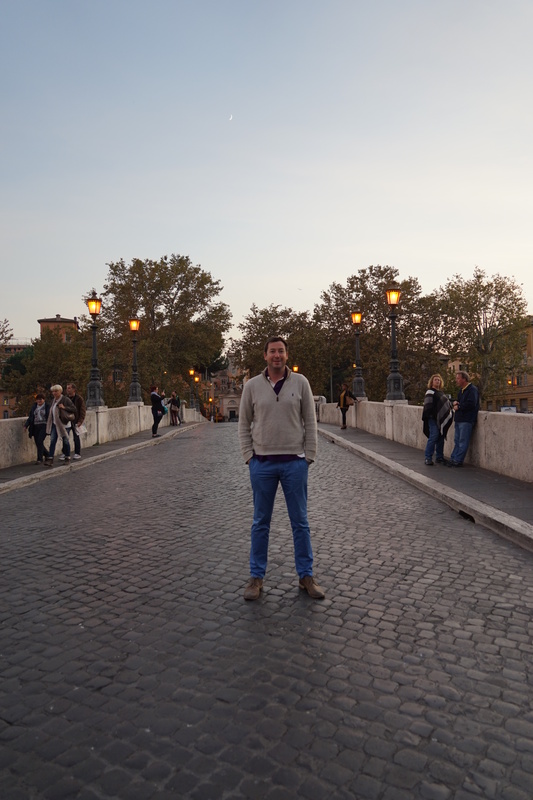 We headed across the bridge and had a bit of an explore along the river before heading down to check out the Colosseum lit up for the night. 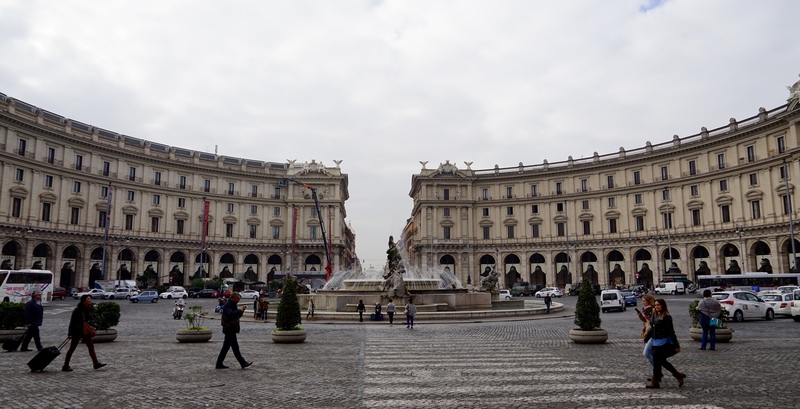 As a consequence of the horrible events in Paris a few days earlier the police and army presence was huge on the streets of Rome, police cars were patrolling almost every street and heavily armed soldiers were present at every train station, monument and attraction. Definitely understandable as a response but it certainly changes the vibe and tone of a city to have such a strong military prescence. 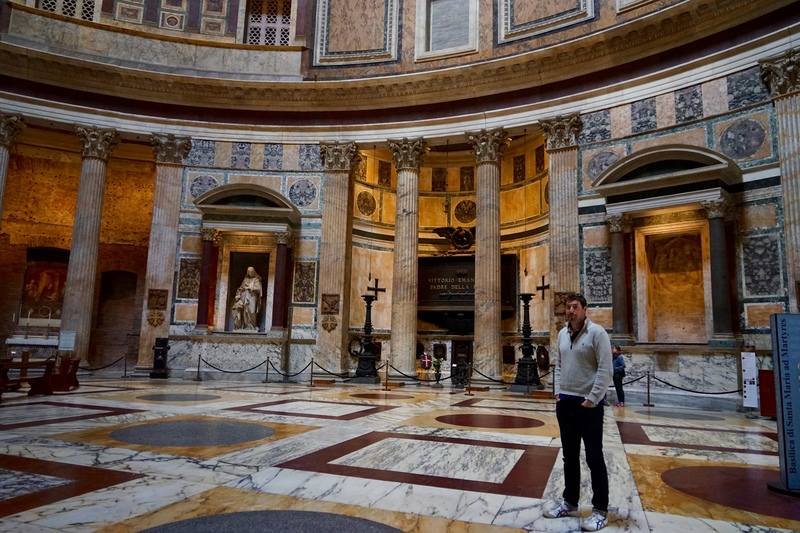 We had tours booked for our last two days in the city so decided to get out and see as many different things as we could on our only other full day, our first stop was the Pantheon. 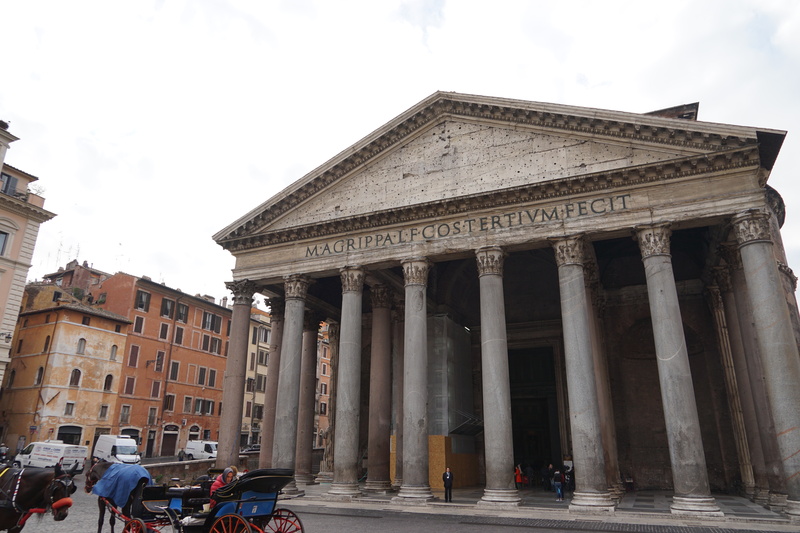 The first construction on the Pantheon started in 27BCE so it is fair to say that it has done well to survive this long. 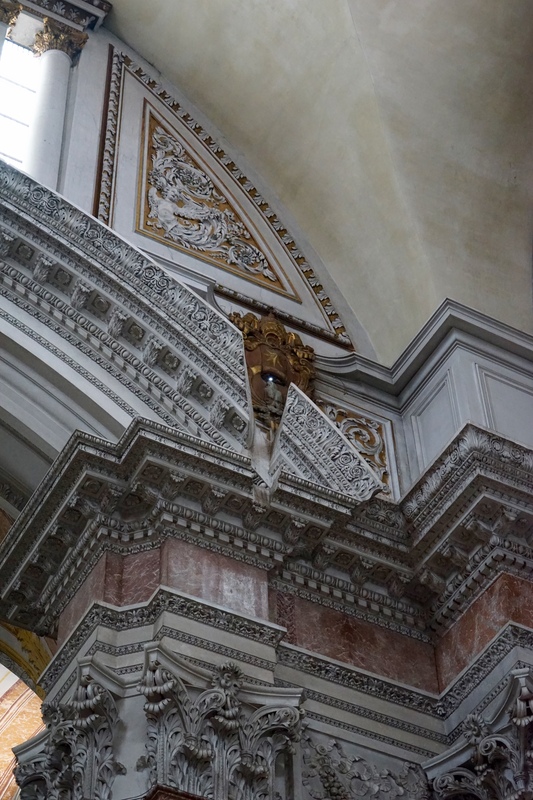 This is in part due to the fact that it was taken over by the church in 609CE, they clearly threw some cash into the decorating, as it is pretty lavish. 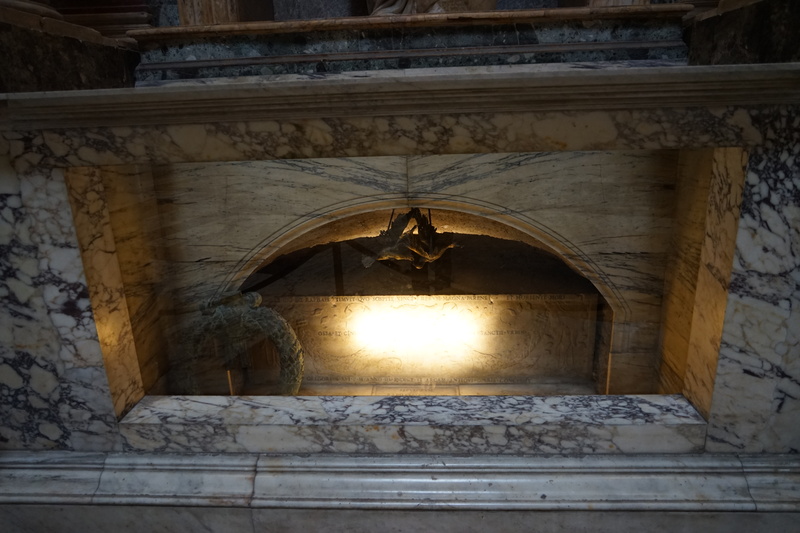 As well as being a place of worship it serves as a tomb for many a celebrity from the renaissance period. The most well known tomb in the Pantheon is that of famous painter Rafael, on who’s tomb is inscribed: “Here lies Raphael, by whom nature herself feared to be outdone while he lived, and when he died, feared that she herself would die.” Fairly high praise for an artist, certainly more than I ever achieved during my post modern neo-classical period in the second term of Grade 8. 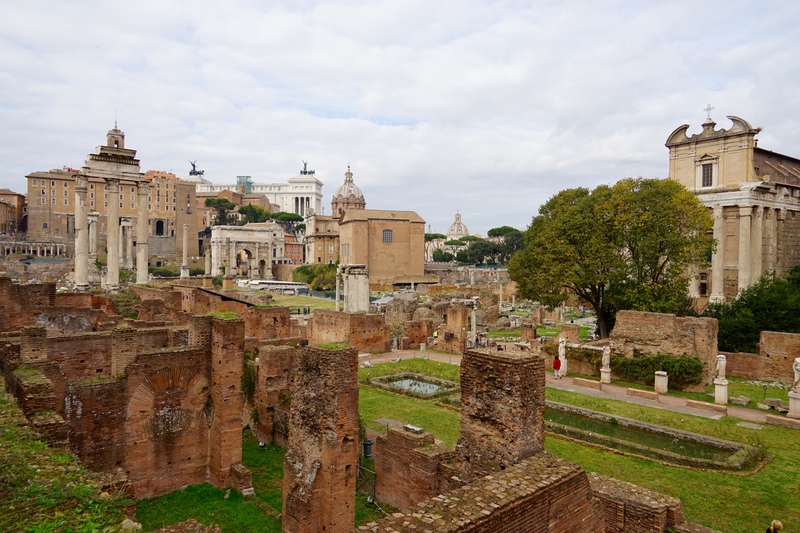 Much as you would expect in a city which was capital to one of the world’s greatest empires there are relics of the past hidden around every corner. 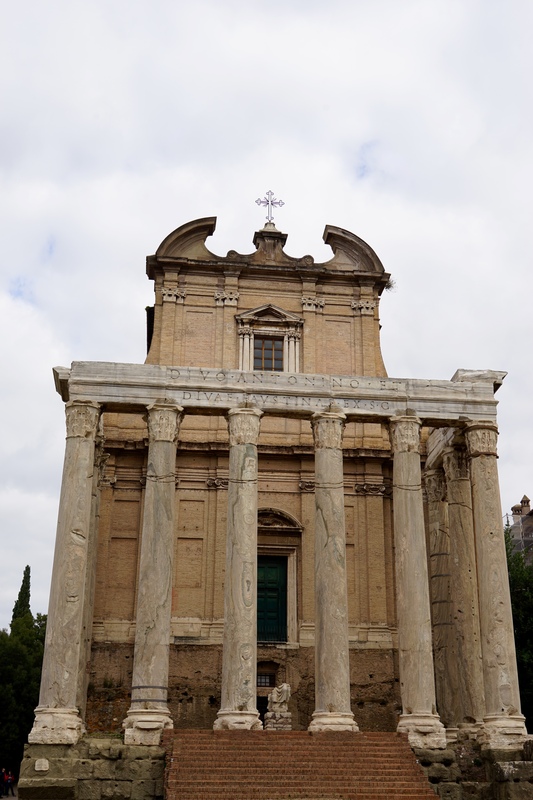 On our way to the Trevi Fountain we found a couple of churches that were over a thousand years old as well as an enormous pillar which had been erected to celebrate victory over the barbarians. 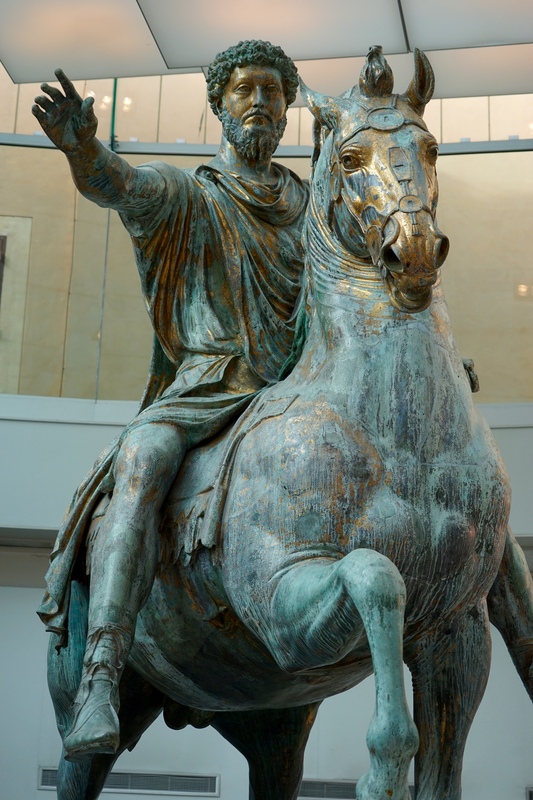 Hard for us to deduce exactly who, it seems the Romans considered everyone barbarians until they conquered them and annexed them into the empire. 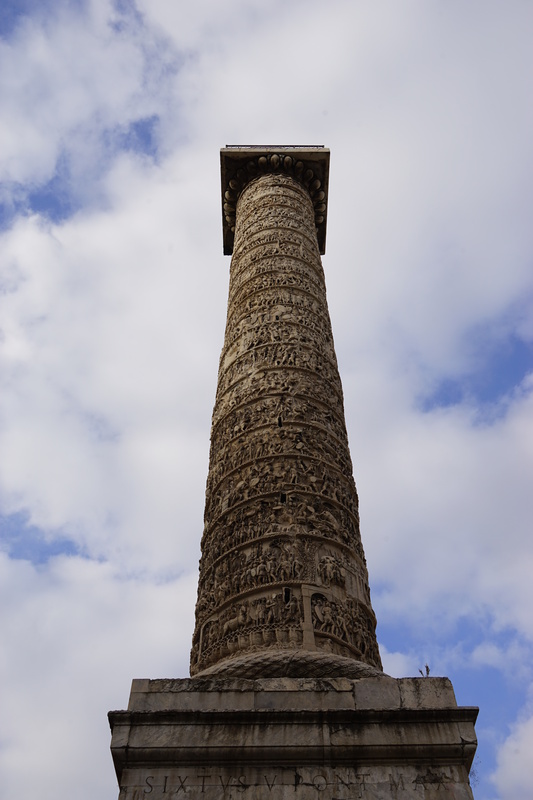 The pillar was enormous and covered with intricate carvings as you can see in the picture below. 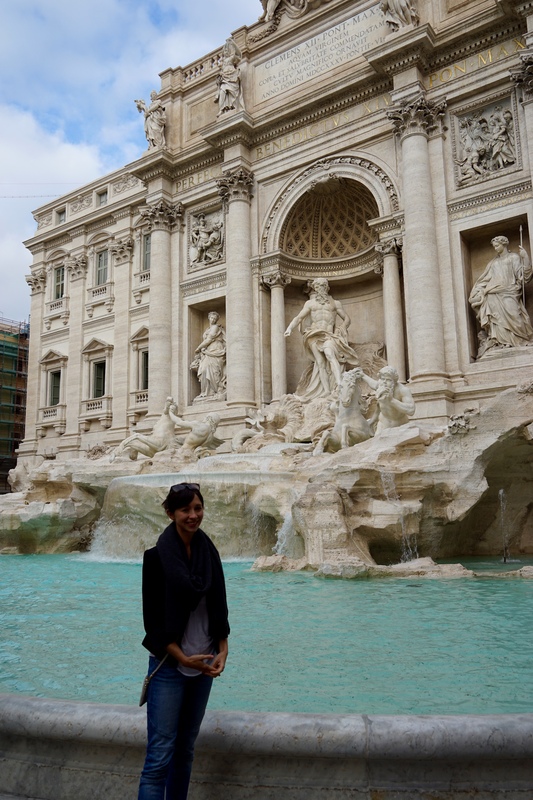 After getting side tracked down a few alleys we arrived at the Trevi Fountain, a giant sculpted instillation almost 50m wide and 30m high. It’s very impressive and took thirty years to build with multiple lead sculptures managing the project along the way. 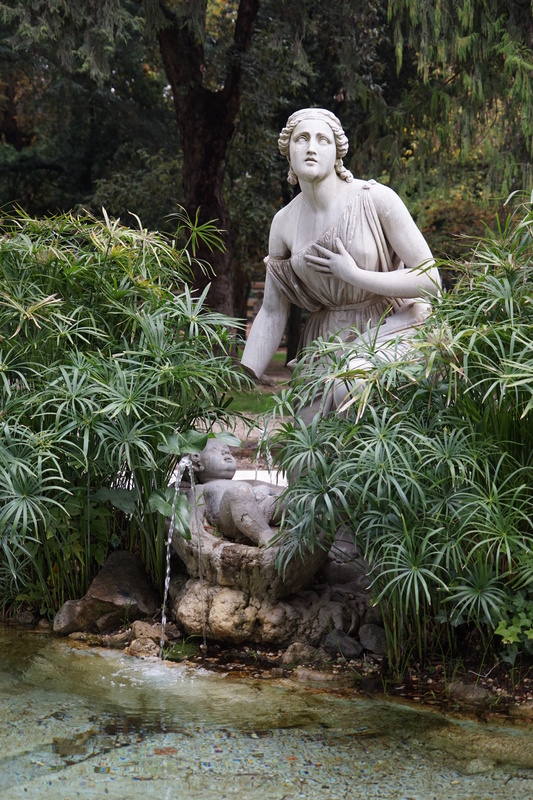 We were quite fortunate to see the fountain as it had only reopened a few weeks before we visited. 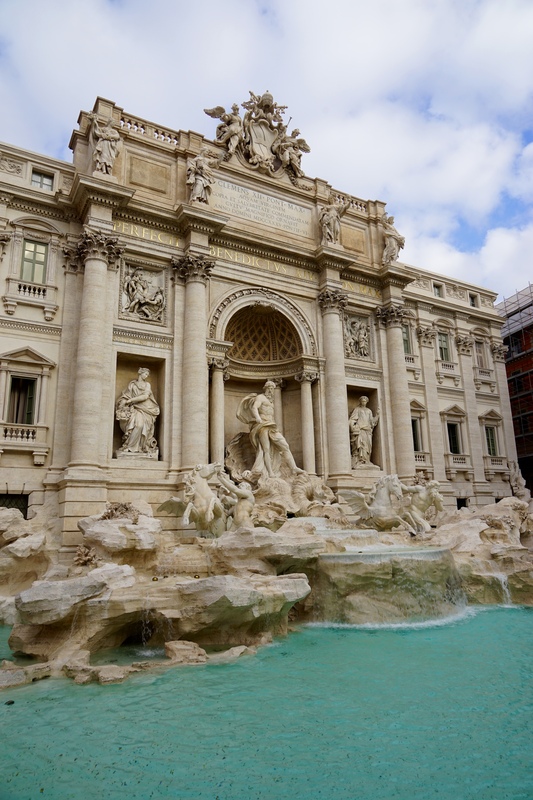 It had been closed for over a year whilst its largest ever restoration works were completed, sponsored by the Italian fashion house Fendi as no one else would come up with the money for the work. 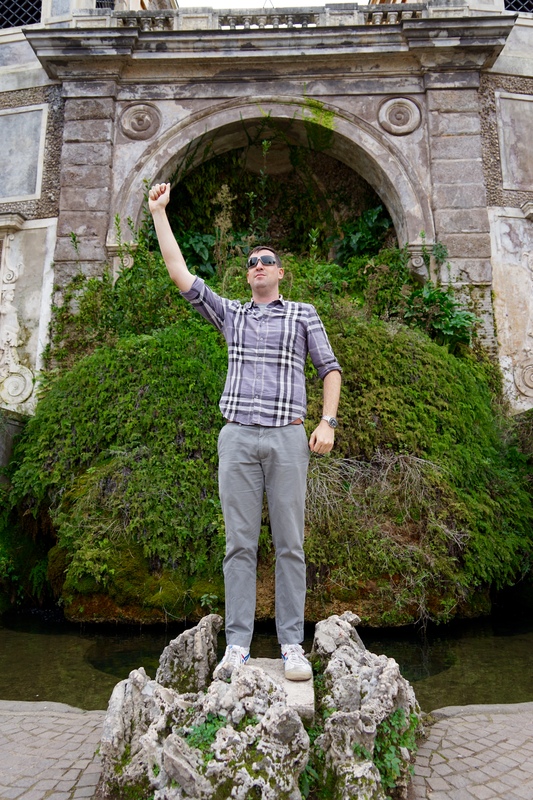 Apparently it is lucky to throw a coin over your shoulder into the fountain, we didn’t bother but wow it was raining Euros once the tour bus groups started rolling in. 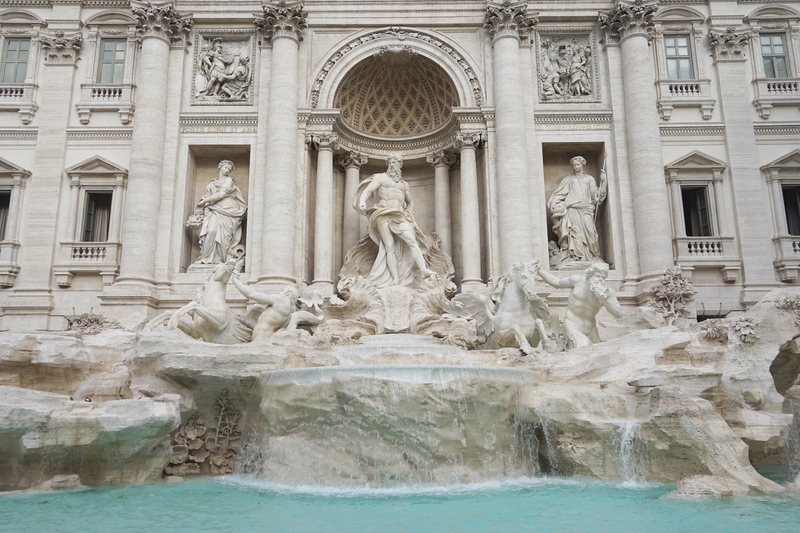 Over three thousand Euros a day are thrown into the fountain, they are recovered by the city and used to subsidise a supermarket for Rome’s poor and needy. 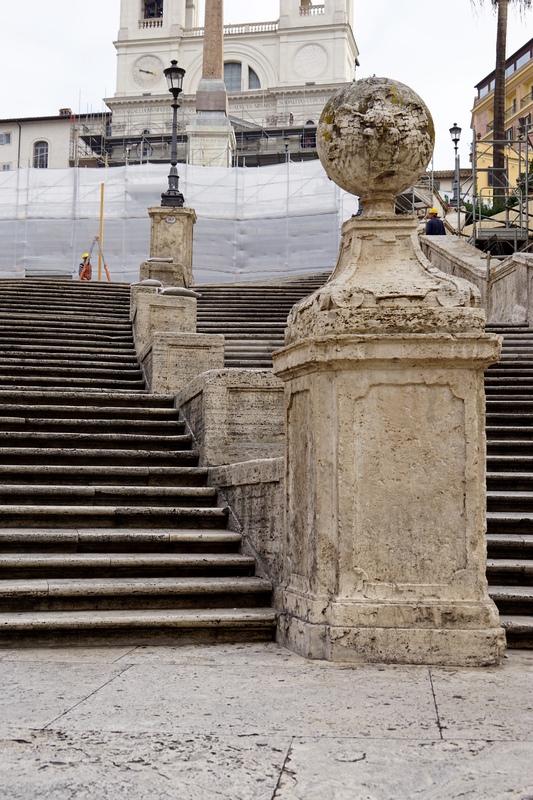 Perhaps we should have thrown a coin because we were out of luck at the Spanish Steps, they were closed for restoration and covered with many a scaffolding and tarp. 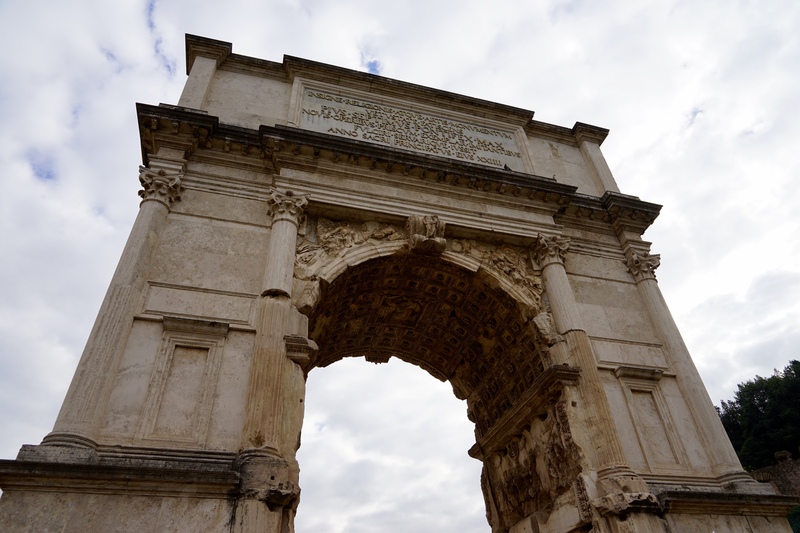 Luckily there were a few other things to check out in the area such as some of the original city gates at Piazza Del Popolo. If you travel to a big city with Jess odds are that eventually you will end up in a park. 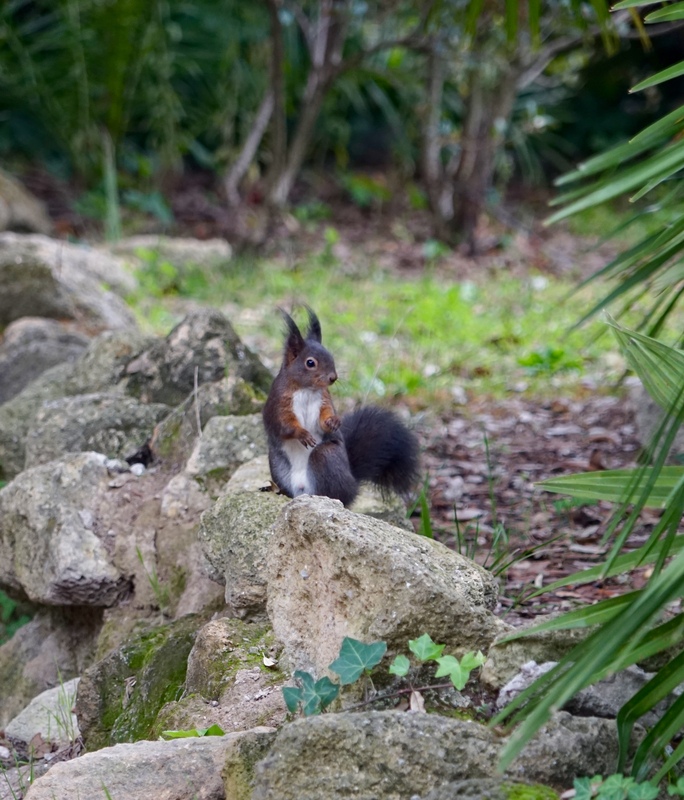 Whilst the parkland overlooking Rome is famous for the Medici and Borghese Villas that occupy it Jess was much more interested in the wildlife and managed to find a black squirrel and some parrots frolicking amongst the statues. 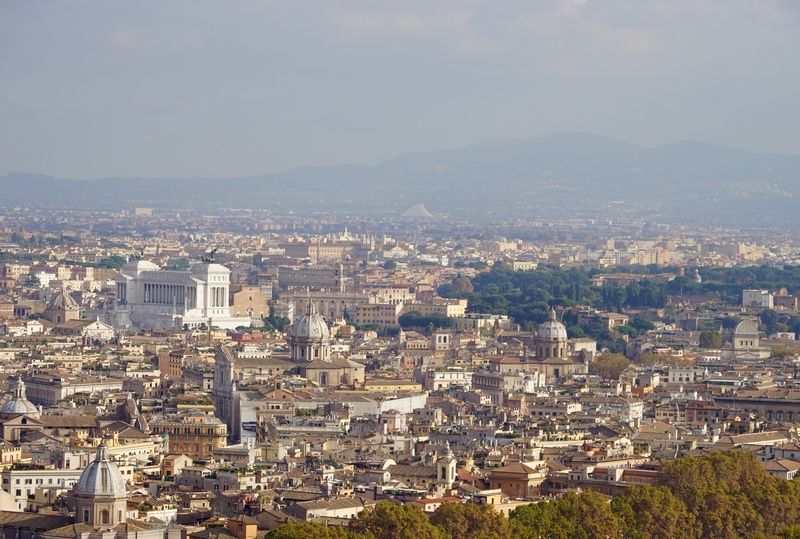 The views from the park were pretty spectacular and you could see all of the domes of the cathedrals, the Pantheon and the Vatican as well as all of the other iconic buildings we had been exploring. 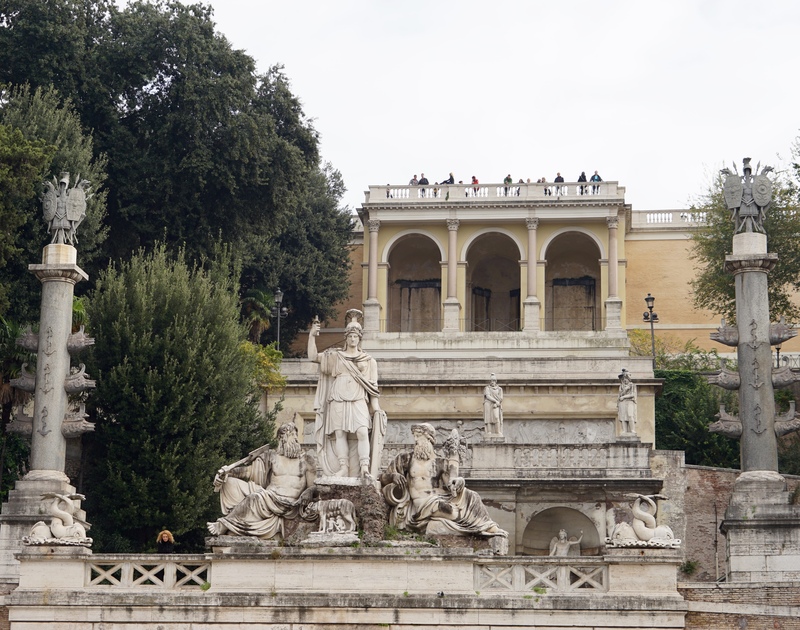 Unfortunately it wasn’t the clearest day that Rome had ever seen but it was still worth climbing up the stairs and nice to get out of the hustle and bustle of the city for a while, Rome is definitely the loudest city we have visited. 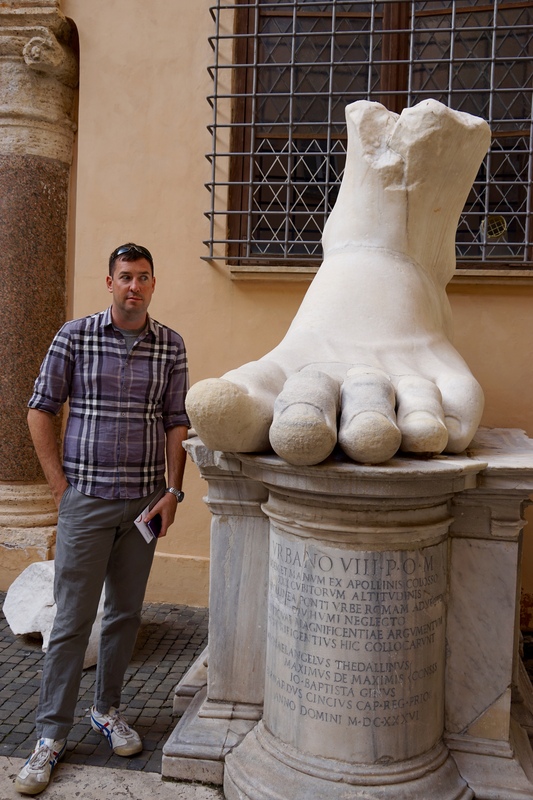 This perception may have been influenced by the fact that our apartment had super thin walls and was by a main street that had deliveries and construction all night… We got very little sleep in Rome. 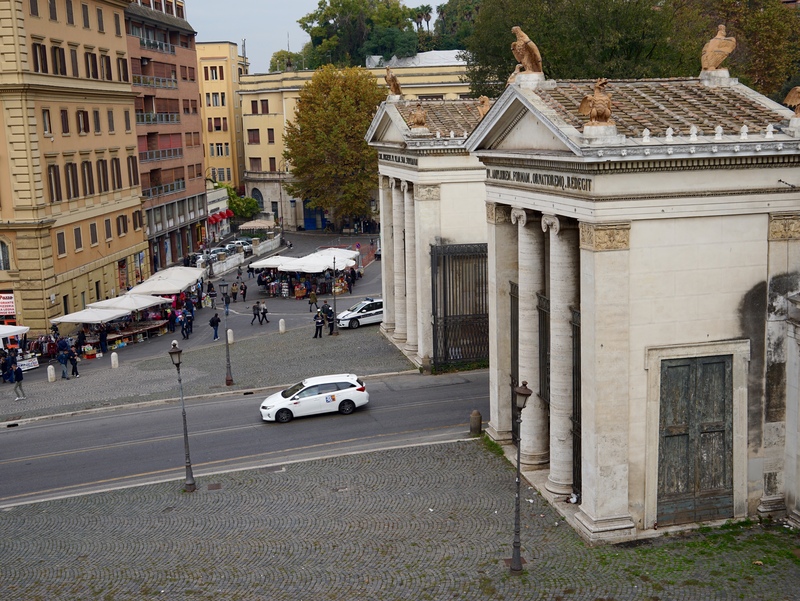 On our way to the Piazza della Repubblica we found a giant basilica that was built in a much less extravagant style than we have generally seen from the church. 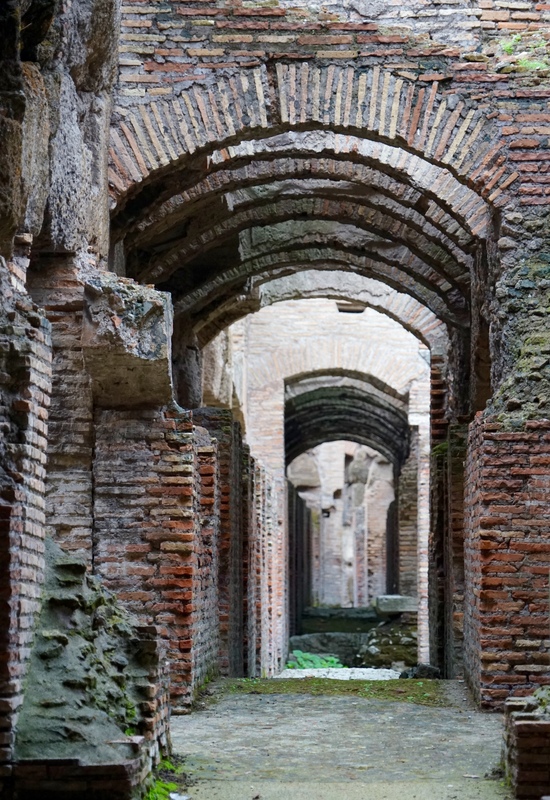 It turns out this is because it was built within the ruins of the Roman Emperor Diocletian’s giant bath house on the orders of the pope in the 1560’s, the renovator chosen for the job none other than the original renaissance man himself Michelangelo. 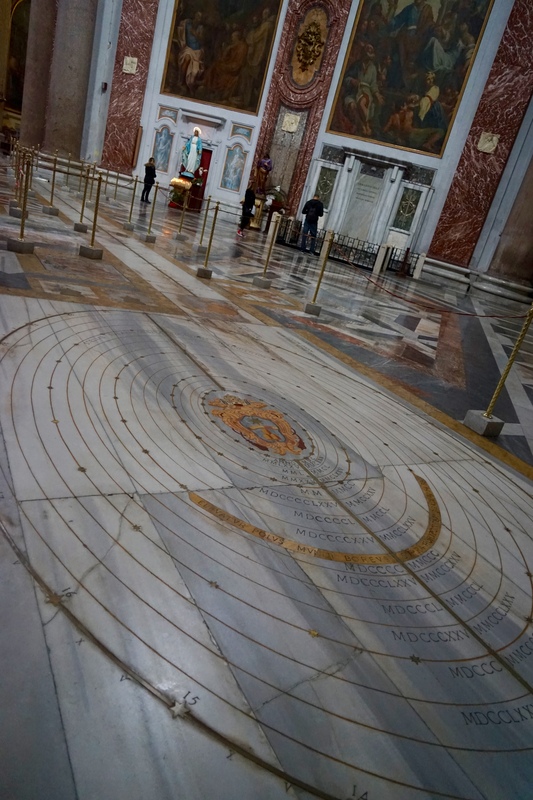 Beyond the architecture of Michelangelo another prominent feature of the church is the Meridian Line calendar added in 1702. It is a 45m long line of bronze which is perfectly aligned to a small hole in the wall of the building. At solar noon a beam of light shoots through the hole and onto the bronze, indicating the time of the year on the calendar. We were there ready to go at the correct time (by accident), as were a few other giant bronze solar calendar enthusiasts… Unfortunately it was cloudy and absolutely nothing happened. 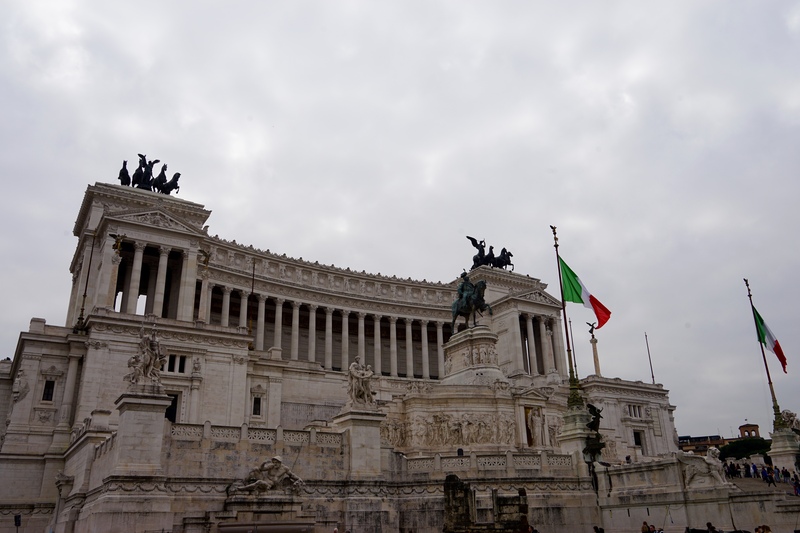 Our last stop for the day was the Altare della Patria, or Altar of the Fatherland, a giant monument/building constructed to mark the unification of Italy and celebrate the first King. 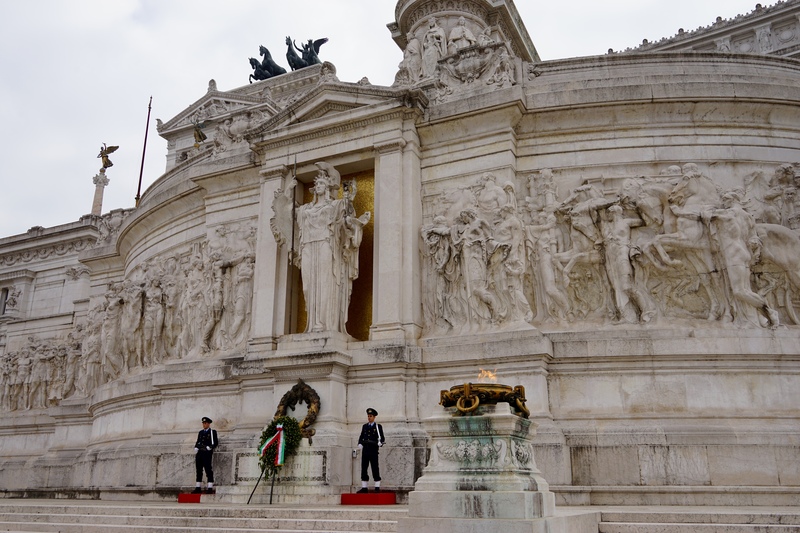 It also contains Italy’s Tomb of the Unknown Soldier, a war monument similar to ours in Australia. 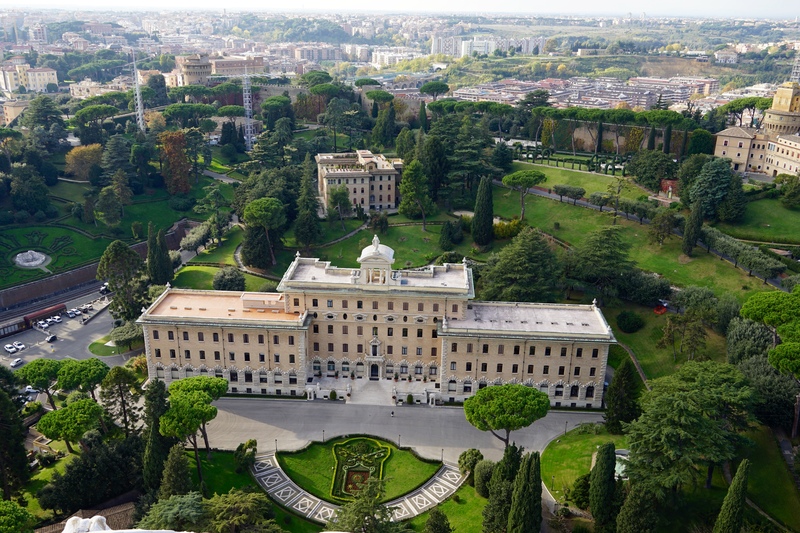 The building is enormous and features giant bronze statues, pillars and sculptures from all over Italy. It was also conveniently located five mins from our apartment so easy to head home and cook up a pasta feast after a big day exploring. 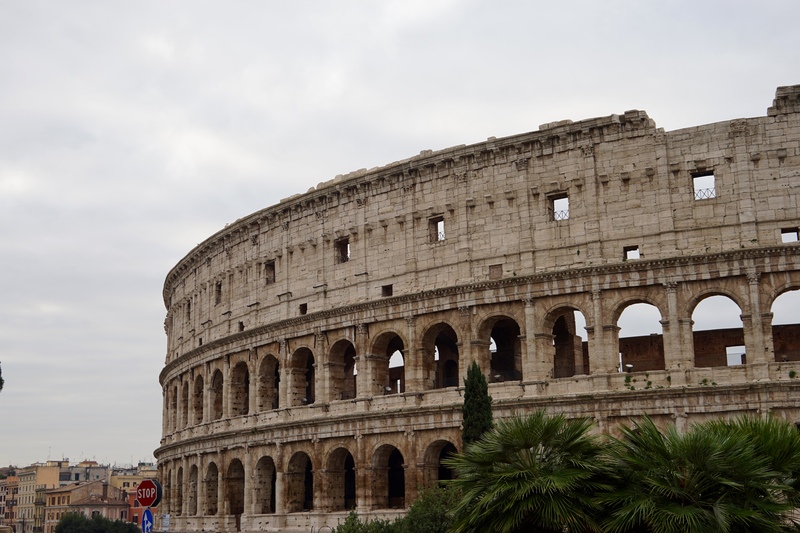 The next day was Colosseum day so in preparation I decided that we needed to watch Gladiator to make sure that we were fully prepared, good call as it’s always an amazing movie. 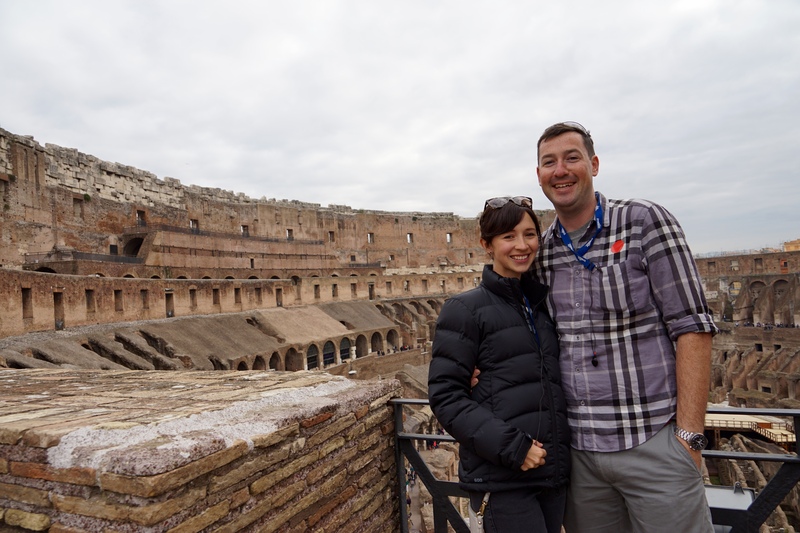 We booked through Dark Rome for our tour of the Colosseum and Roman Forum because of the additional access to restricted areas such as the Colosseums arena floor, underground and third tier. We were glad we did, we had a great tour leader, a relatively small group and it was an amazing day. 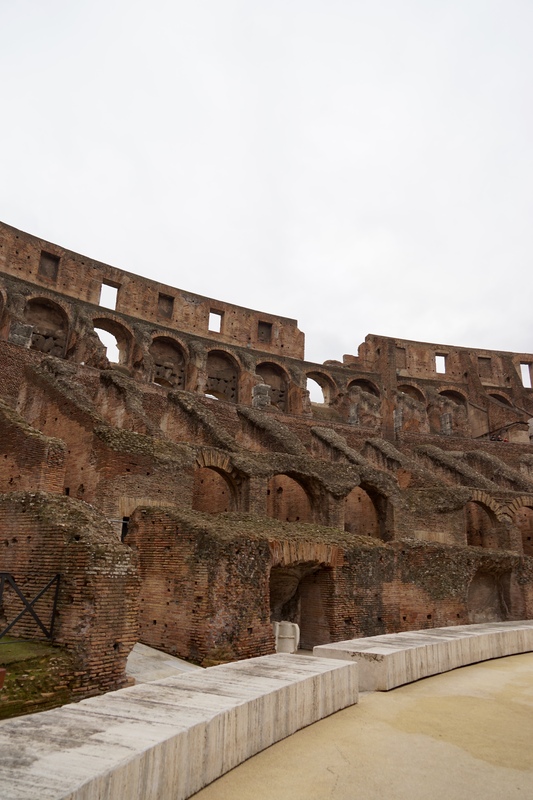 After a quick intro we walked past everyone in the lines and had immediate access to the site, we were amongst the first to enter the Colosseum for the day and on arrival we were met by a staff member who took us through a couple of locked doors and out on to the arena floor. 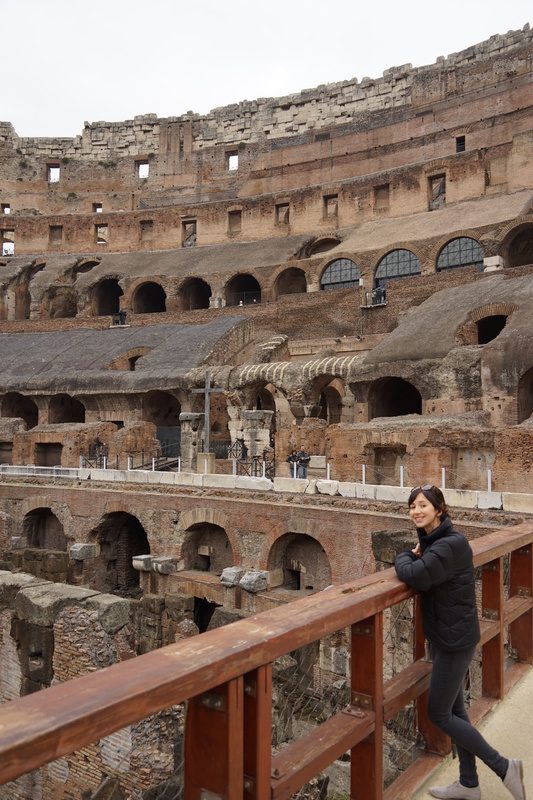 It was incredible being able to walk out onto the floor of the Colosseum and a great way to get an idea of its massive size. Against my better judgement and at Jess’s insistence I chose not to unleash a torrent of pre prepared Gladiator quotes at this moment. No doubt something I will always regret and something no one had ever thought to do before. 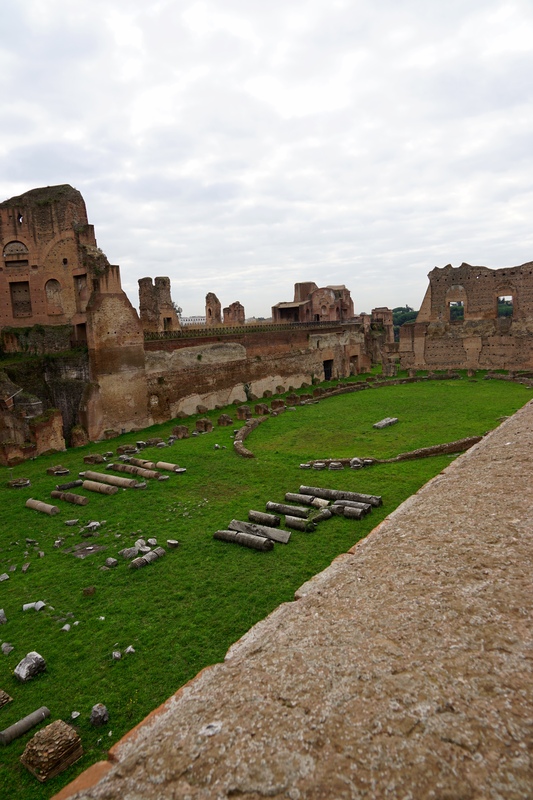 From the arena we were lead through more locked gates and down a dark staircase to the Colosseum Underground. We figured it was kept dark to help create atmosphere, turns out the lights were failing because the restoration works were overloading the grid. 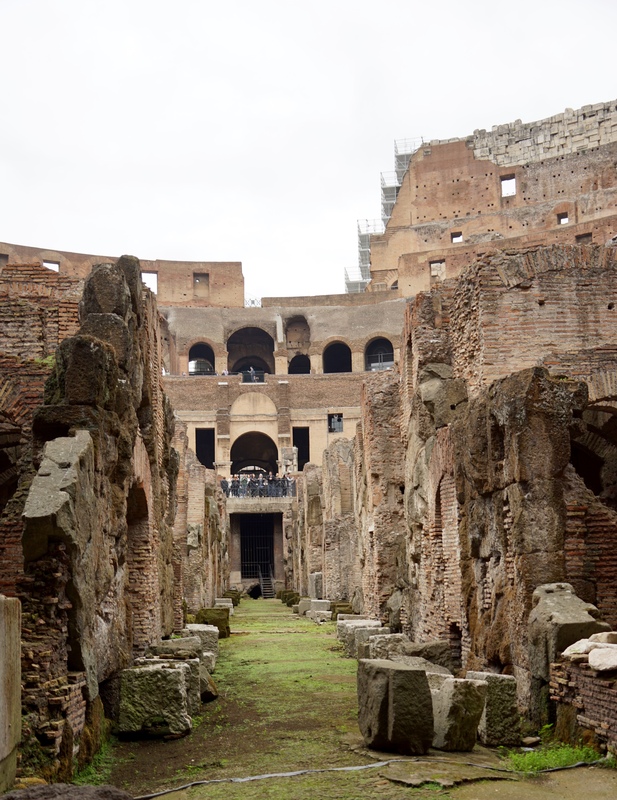 The underground was really interesting and our guide pointed out the different areas where gladiators and animals were kept beneath the arena, where the trapdoors were and how they worked. It was definitely a fairly impressive feat of engineering for its time. Our final stop was the Colosseum’s upper tier, quite a climb from the basement, the exclusive access was very evident here as heaps of other tourists could only watch on with disappointment as we were led through a massive gate up the original stairs and onto the highest level of the Colosseum. 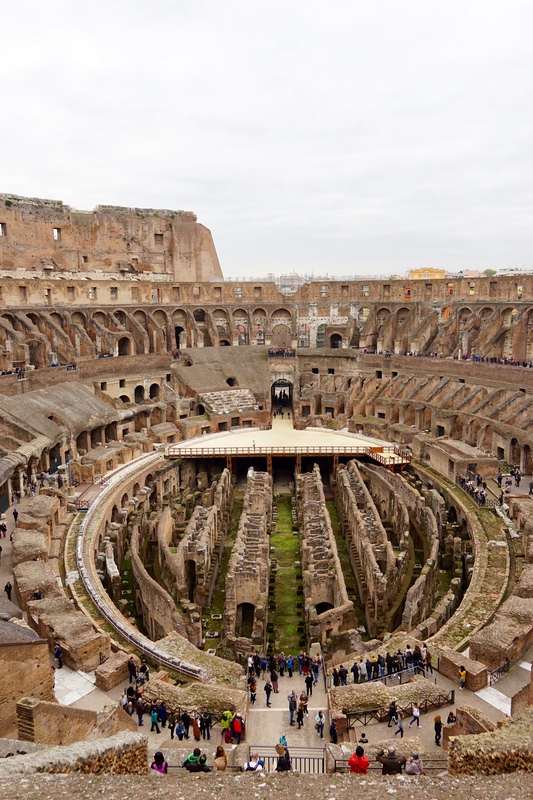 The view from the top was sensational and it is easy to see why the Colosseum is one of the most iconic archaeological sites in the world. We were amused to discover that this is where the women spectators were located, as it was deemed far too dangerous for them to be any closer to the gladiators. 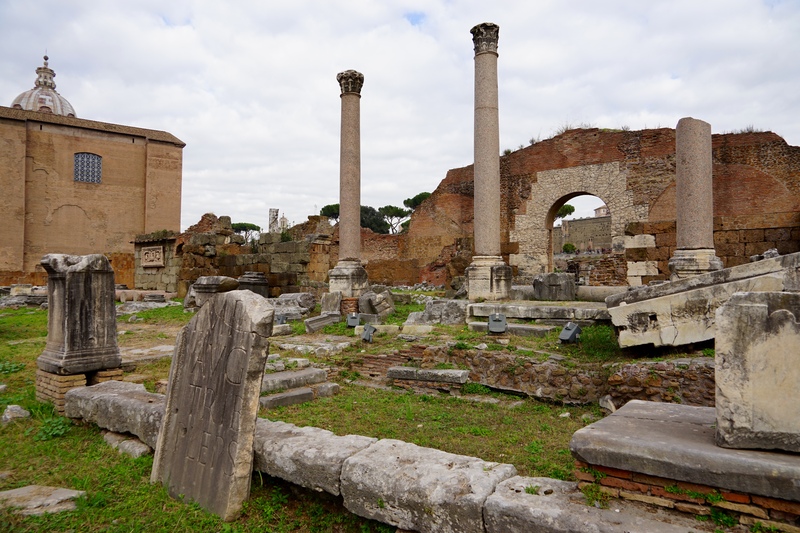 Many a young lady fell deeply in love with the gladiators and some even left their families for them. We spent a bit of time up here taking in the view and even managed to get a rare photo with both of us. From the Colosseum we followed our guide down the street to the Roman Forum, the area of Rome that held many of the most important civil buildings and temples. Some of the temples here go back to as far as 700BCE and some are still relatively intact. 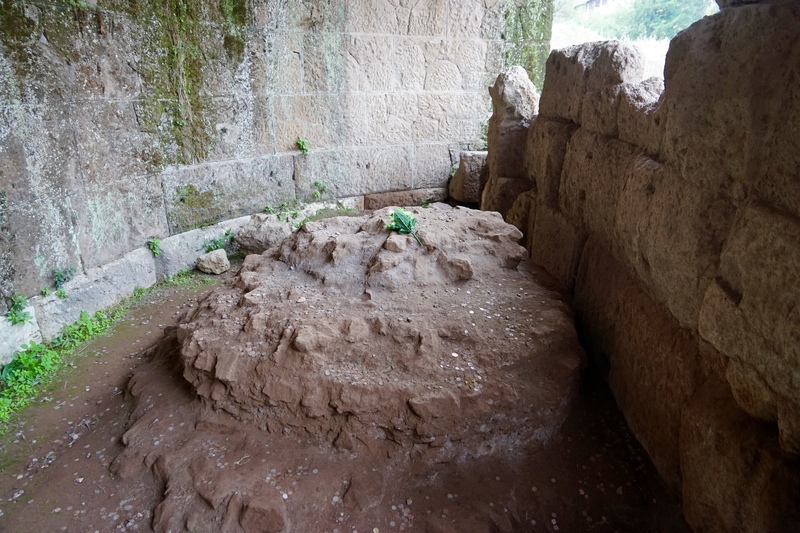 One of the most popular areas in the forum is the niche and altar to Julius Caesar, it is hypothesised that he was cremated here and it was on this site that a temple in his honour was built after he was elevated to the status of a god posthumously. 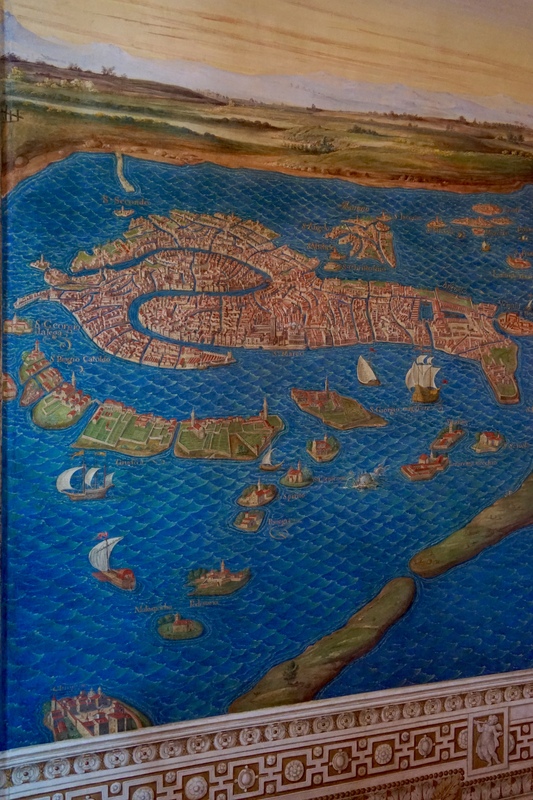 Most of the buildings that survived intact were temples that were taken over by the church and maintained over the centuries, probably not something that the original followers would be excited about but worked out well for tourists. 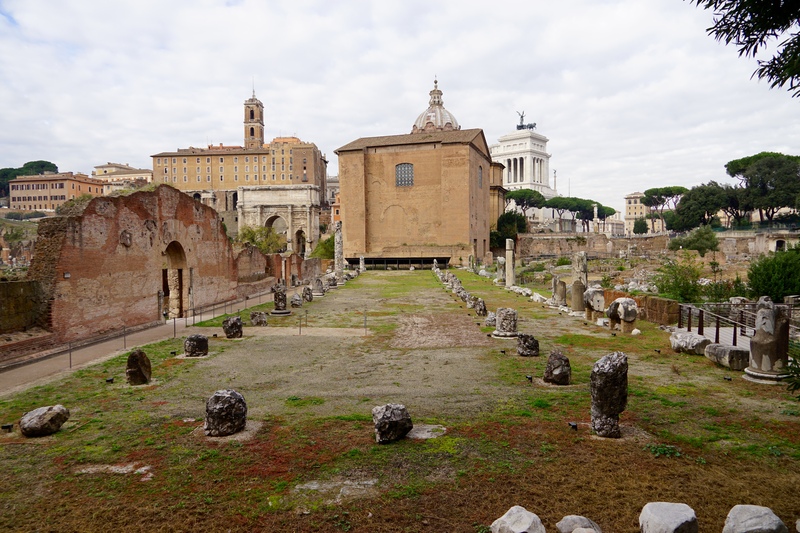 Also on the site is a section of the original road complete with chariot marks and a couple of victory arches raised to celebrate more victories over those damned barbarians. 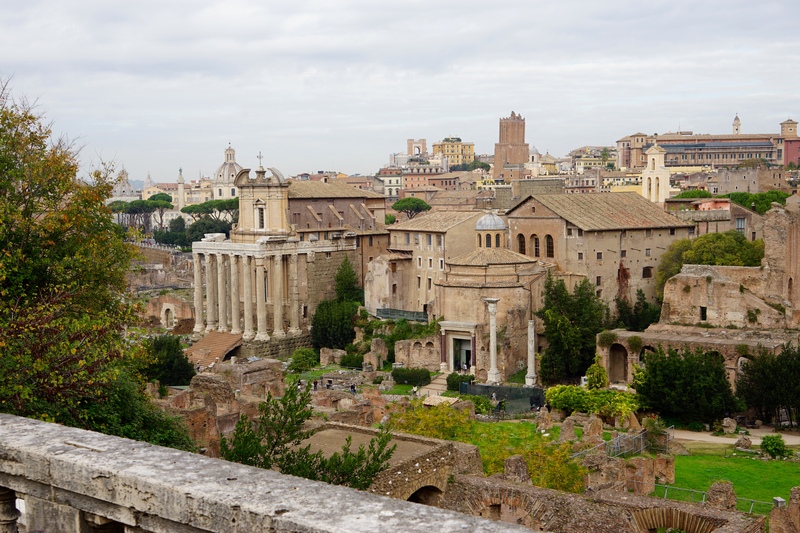 Climbing above the forum we reached the Palantine Hill, in Roman mythology it is considered the origin of Rome as it is where Romulus raised the original settlement after being raised by a she-wolf with his brother whom he subsequently slayed. 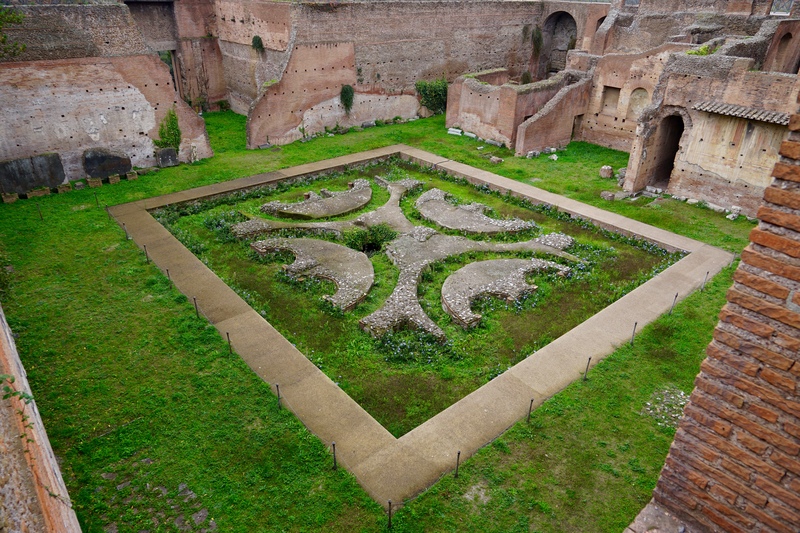 During the Flavian dynasties rule over Rome a giant house was built on the Palantine Hill. 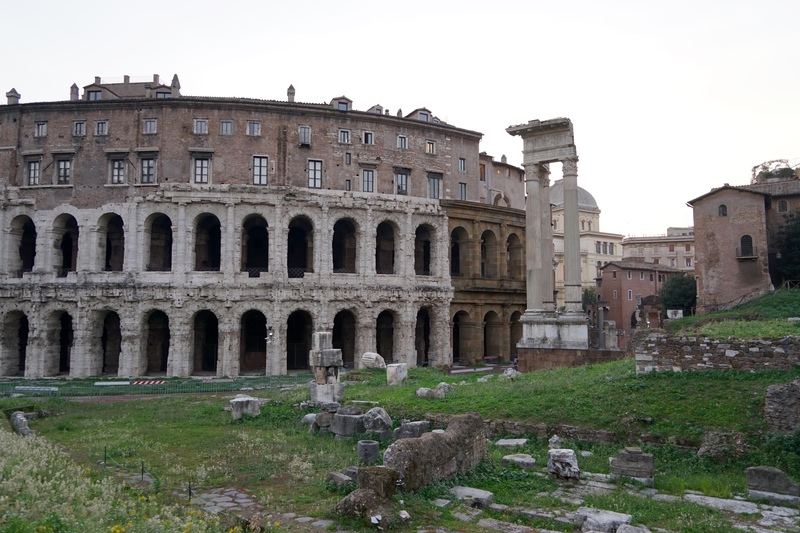 It was so opulent and enormous that all future houses of a similar scale were considered “palaces” and so named for their likeness to the Flavian original. 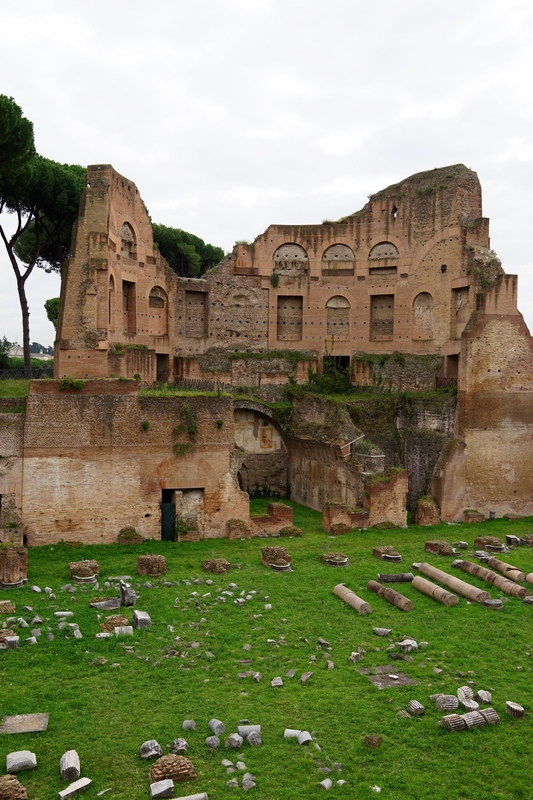 As well as a giant house the Emperor had his own stadium built next door with a corporate box for entertaining visiting dignitaries. 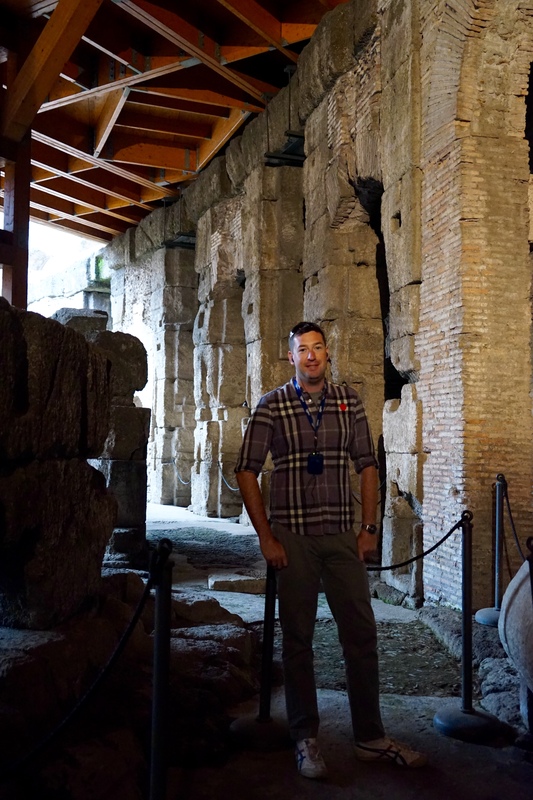 We decided to keep rolling with our architectural theme for the day so after finishing up at the forum we headed for the Musei Capitoline and see some of the relics which had been recovered from the forum. 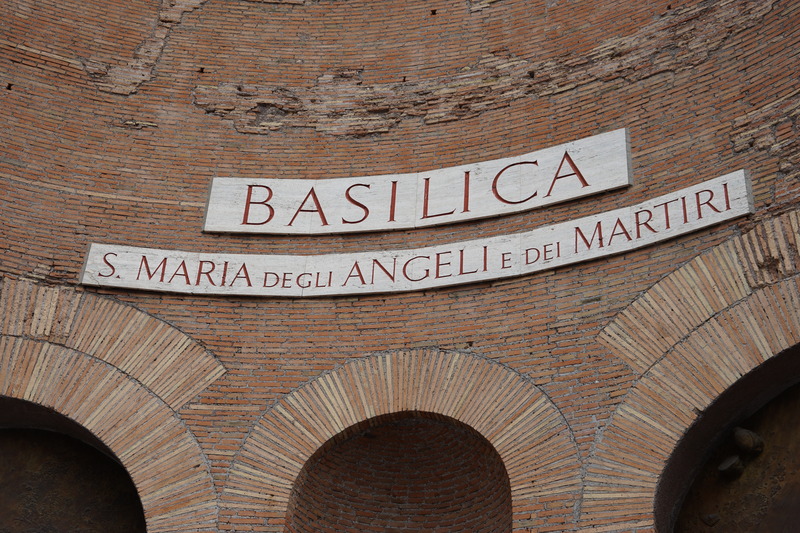 It was a great museum and there was an incredible volume of relics and masterpieces from the Roman era. 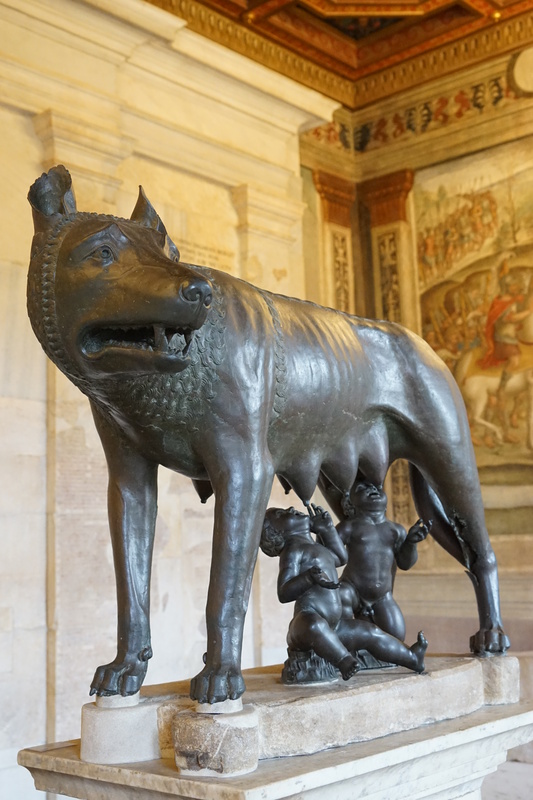 Highlights included a giant foot, a bronze statue of Marcus Aurelius and the original bronze statue depicting the She-Wolf who raised Romulus, the founder of Rome. Up on the third floor they had a great terrace restaurant that looked out over the city, we sampled some more delicious Italian cuisine and took in the view before diving back into the museum for another couple of hours before calling it a day. The next day we were up early and off over the bridge for our tour of the Vatican City, for this one we opted for Walks of Italy’s tour as it gave great access to everything and we had read that their guides were the best. 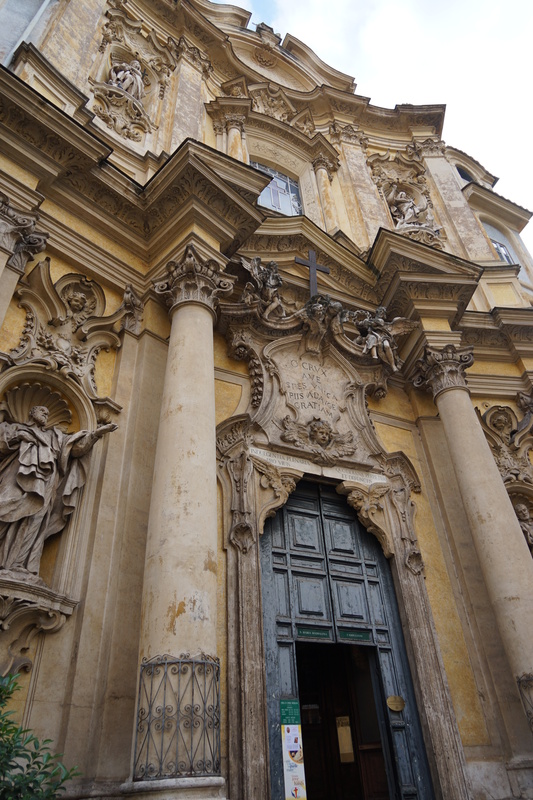 Our guide was great, she had more of a focus on the architecture, sculpture and art than just focussing on the religious side of things which kept things interesting. 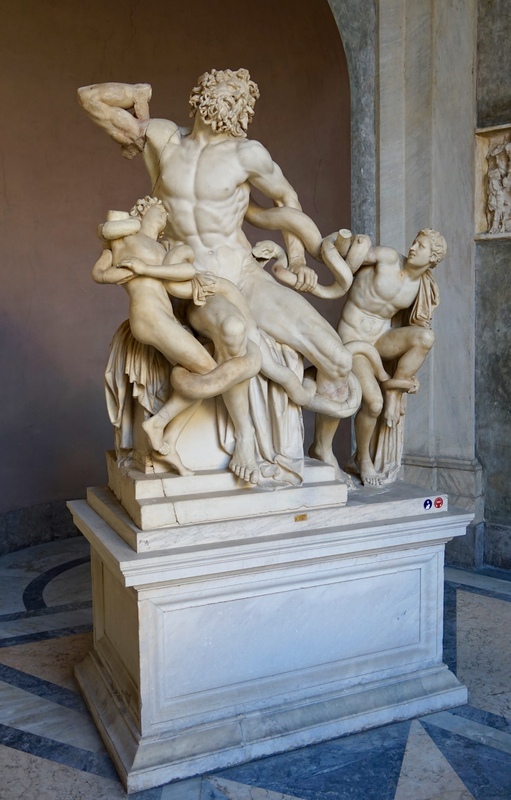 The tour started with the Vatican Museums (there are several) which host one of the best collections in the world of sculpture and art. 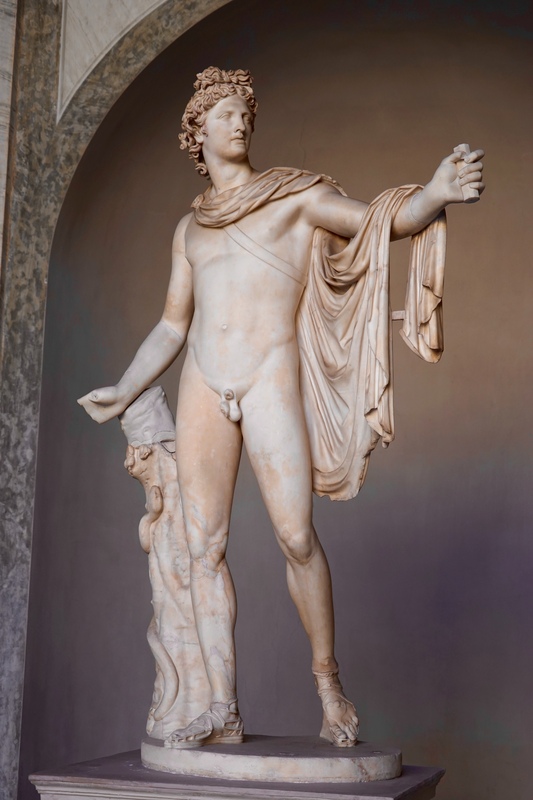 They have many originals from the Roman age such as the sculpture below of Emperor Hadrian’s lover whom he elevated to god status after his death. 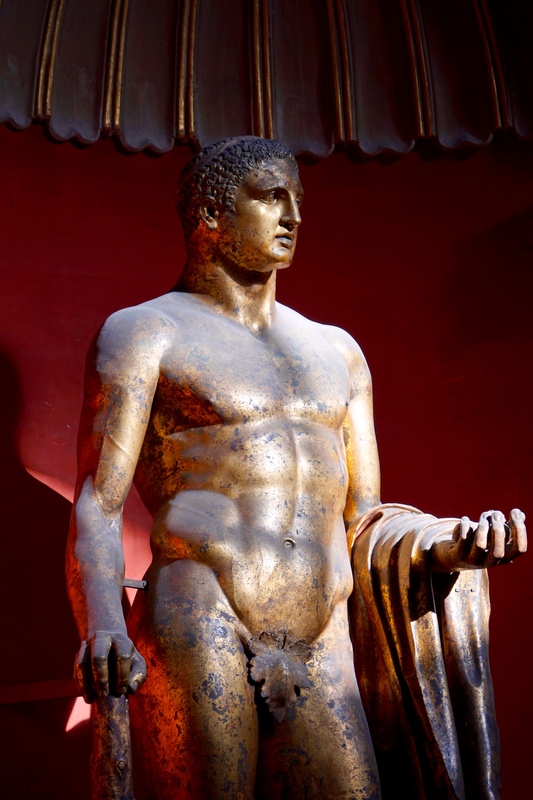 They also have some pieces that survived from the Greek empire such as the Bronze statue of Hercules, this piece was preserved when many were melted down so the bronze could be recycled, not because of its quality but because it had been struck by lightening and was therefore “touched by the Gods”. 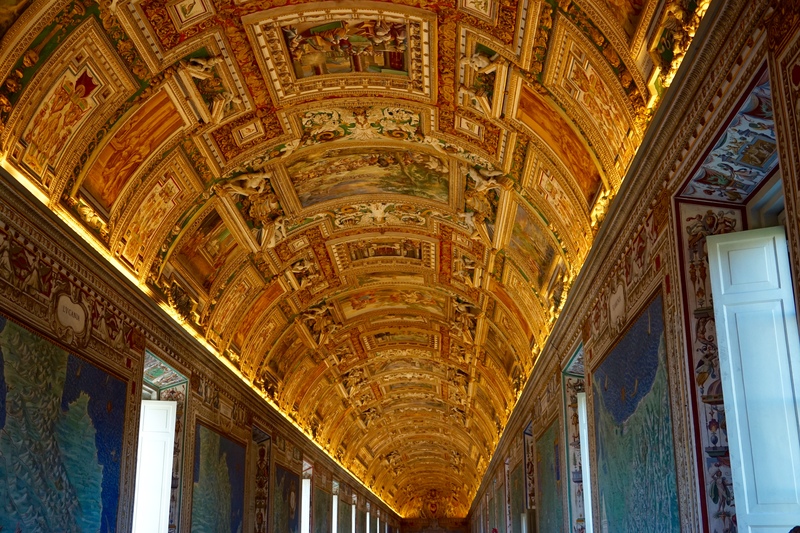 One of my favourite spaces in the Vatican is the corridor known as the Map Room. 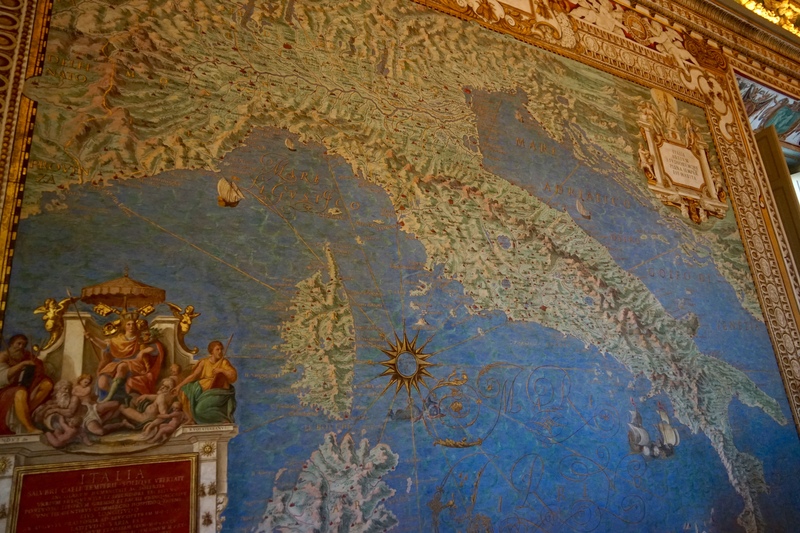 There are incredibly intricate maps of the individual provinces of Italy on the panels of the wall as well as a giant map of the entire country, a fairly flash gilded roof as well. 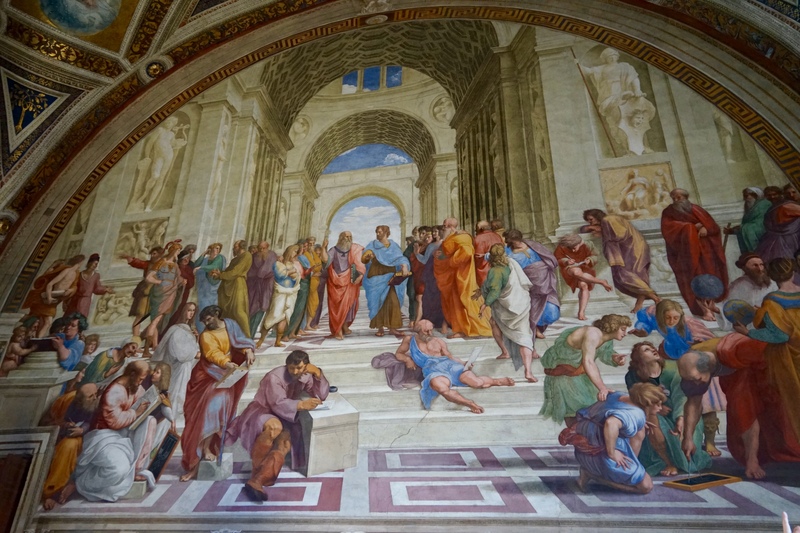 The big highlight of the day for me was the opportunity to see the masterpieces of Raphael and Michelangelo and to hear the history of their rivalry as the greatest artists of the renaissance period. 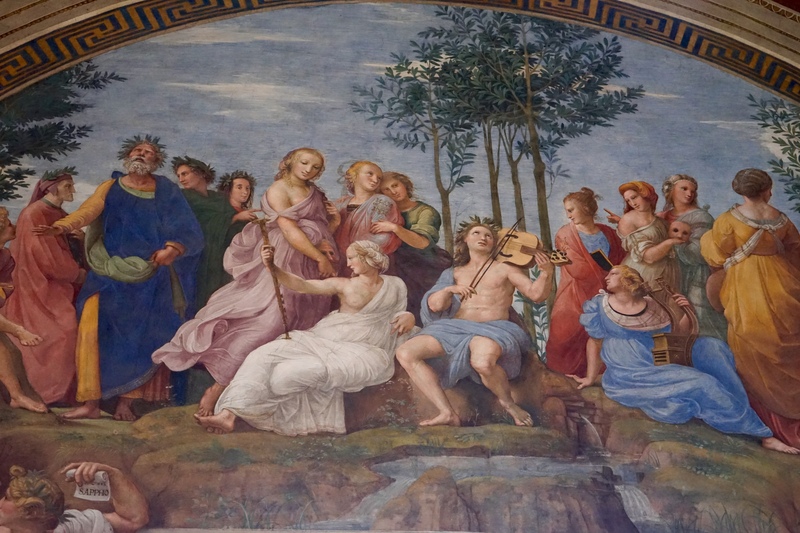 First up were a series of rooms painted by Raphael, he was originally brought in by his uncle who was the Pope’s architect to paint as part of a team. 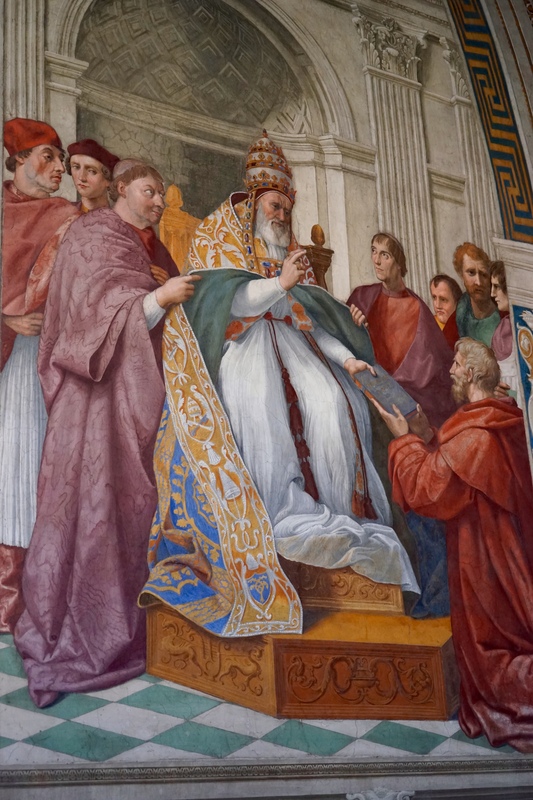 As the story goes the Pope saw his work and immediately fired all of the other painters and commissioned Rafael to do all of the remaining frescoes himself. 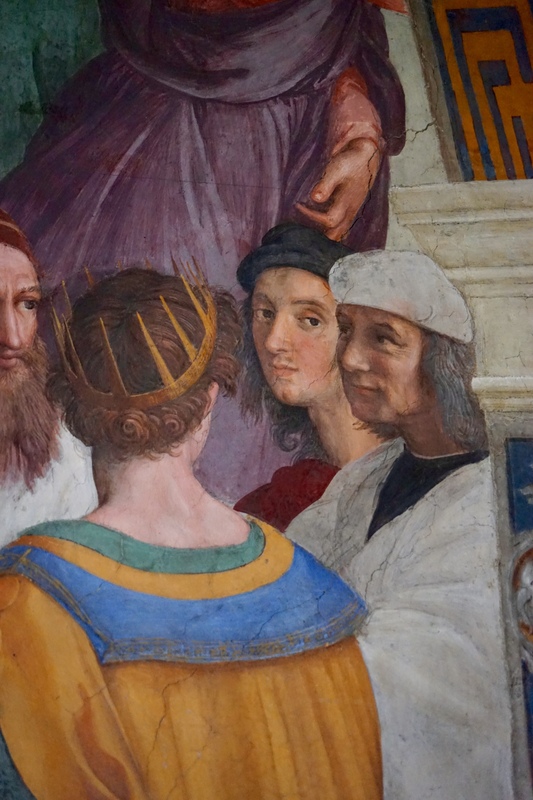 In the first picture below he painted himself in, he is the chap wearing the black hat and red shirt. He was pretty big on the social scene back in the day, rolling around with an entourage and beloved by the ladies. This did however prove to be his undoing, one dalliance too many saw him struck down by syphilis at 37. 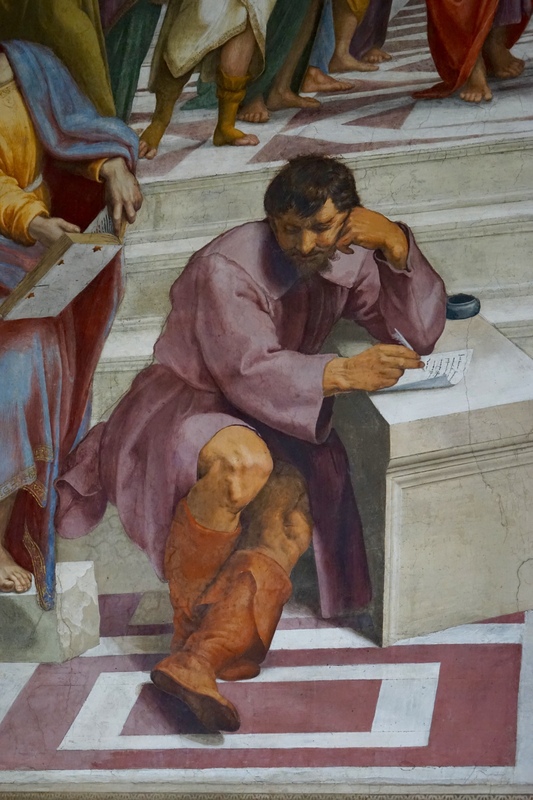 He also painted in his great competitor Michelangelo, showing him looking sad and alone on the steps wearing his work gear when everybody else was dressed to party. 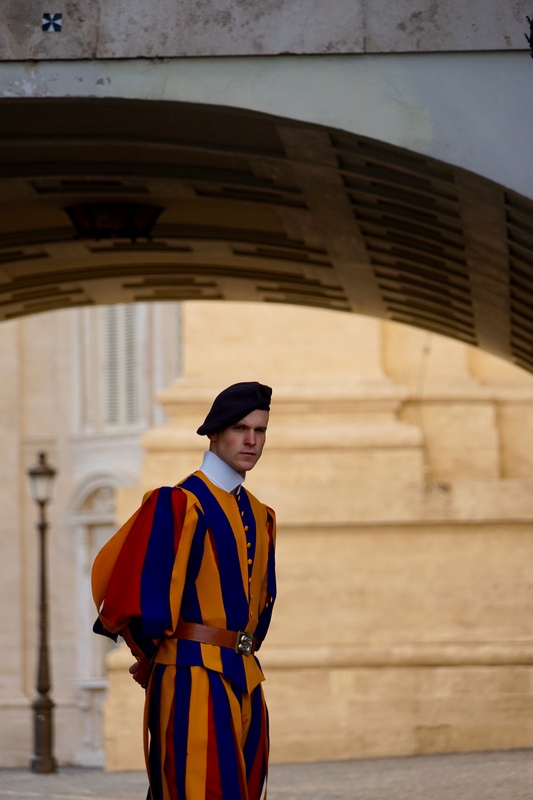 Michelangelo, despite considering painting a low form of art, is best known for his works on the roof of the Sistine Chapel, we went in there as part of our tour but unfortunately the security guys are intense about no photos so no pictures from that bit. 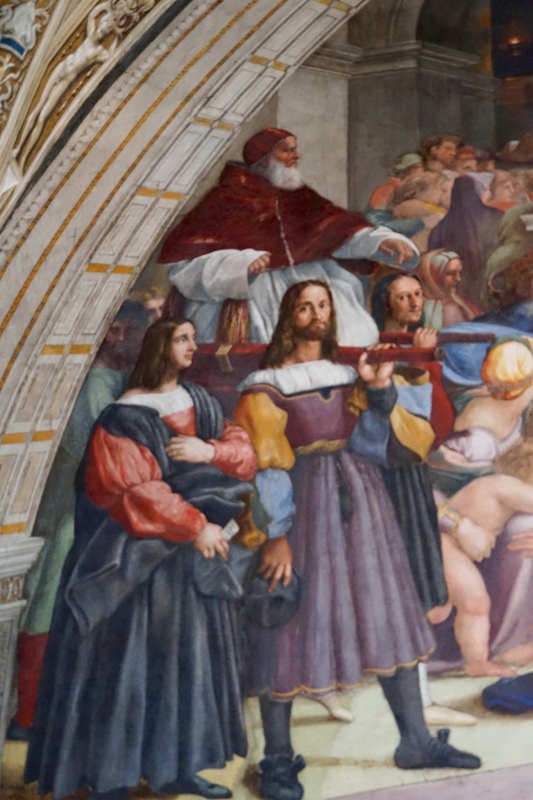 When we were in the Sistine Chapel it was considered incredibly quiet in terms of visitors and we were told how lucky we were, for us it was uncomfortably crowded. Apparently on a busy day it is impossible to see the floor and you have to almost fight your way through the building, not unhappy to have missed that experience. 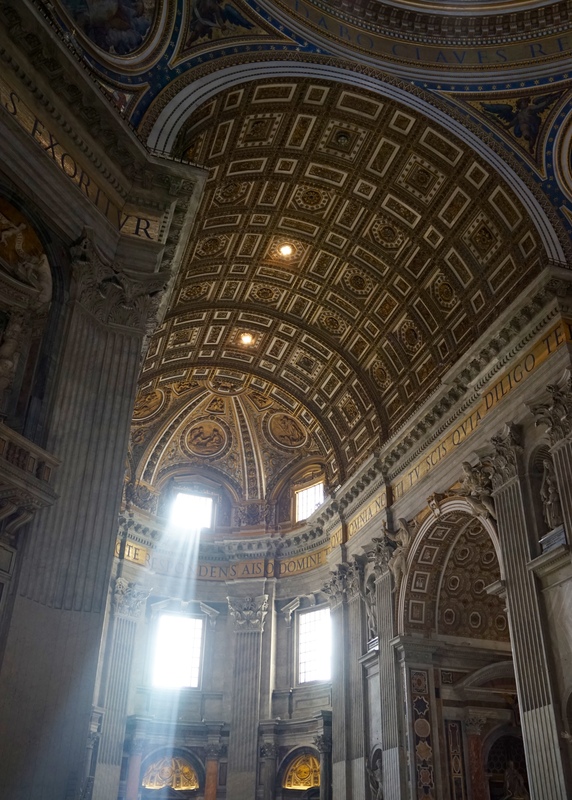 After the Chapel we had our final destination on the tour, St Peter’s Basilica. 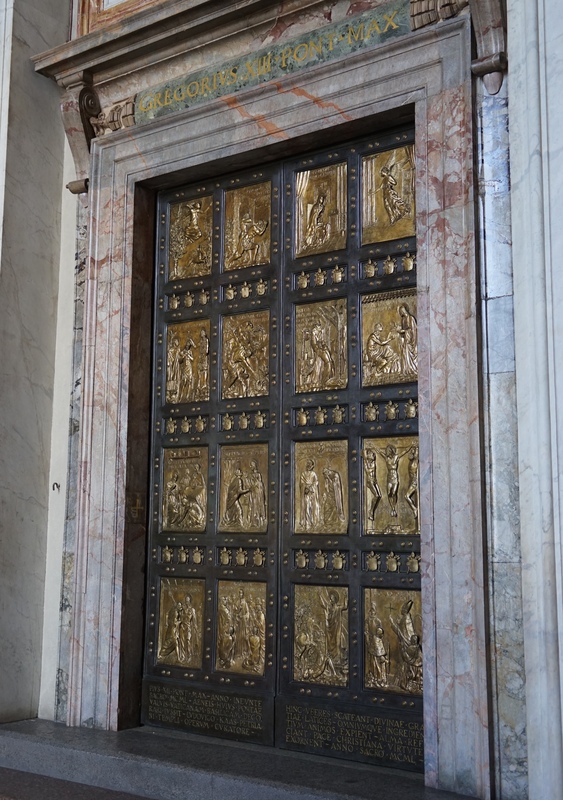 On our way to the main entrance we passed the Jubilee Door, a magic door made out of gold which immediately on passing through it absolves you of all sins. 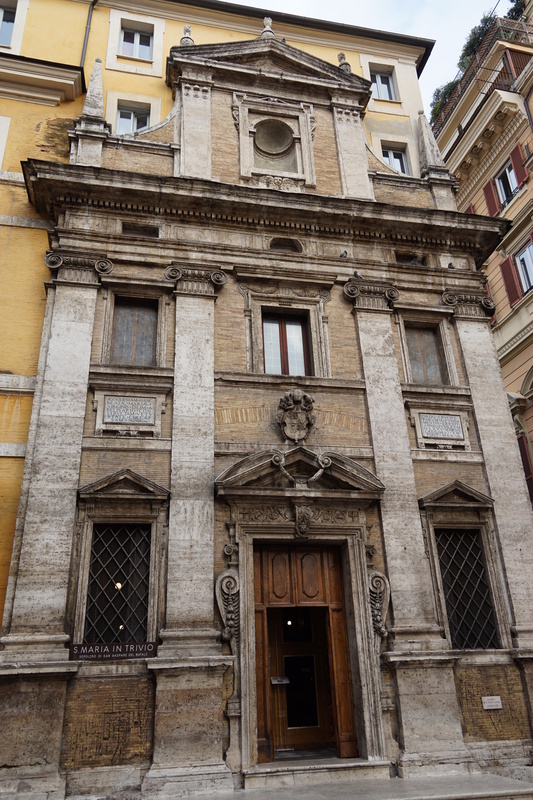 Most of the time the inside of it is bricked up, but as the Pope has called a special jubilee it was being un-bricked when we visited and prepared to start de-sinning people from December 8. The building itself is incredible both in scale and decoration and filled to the brim with holy relics such as disciple bones and shrouds. 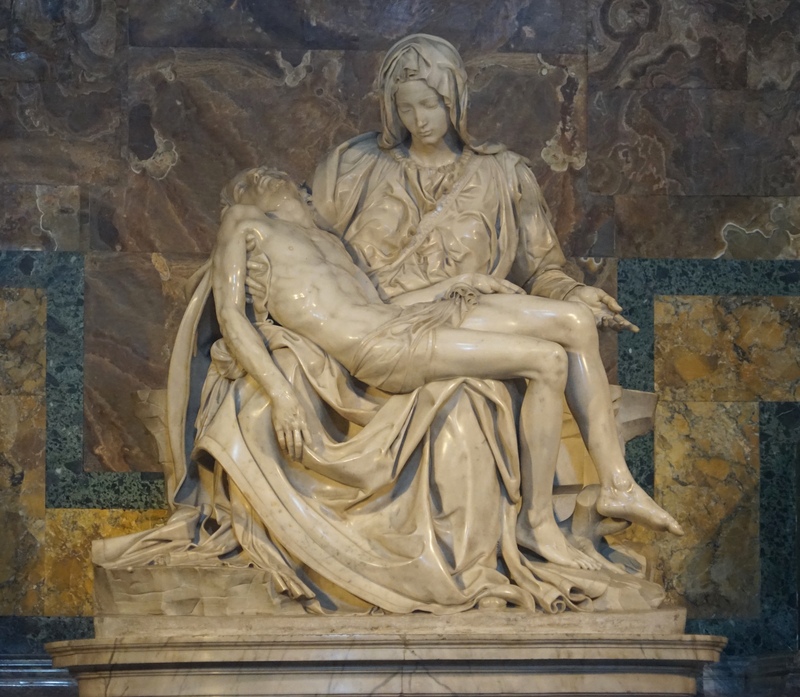 Also inside is another of Michelangelo’s masterpieces “The Pieta” a sculpture of Jesus’s mum holding him post crucifixion. The quality of the work is incredible, unfortunately it now needs to be viewed from behind a glass window as in 1972 some nutter attacked it with a hammer whilst screaming “I am Jesus Christ”. Another great element is the window at the front of the cathedral overlooking the altar. 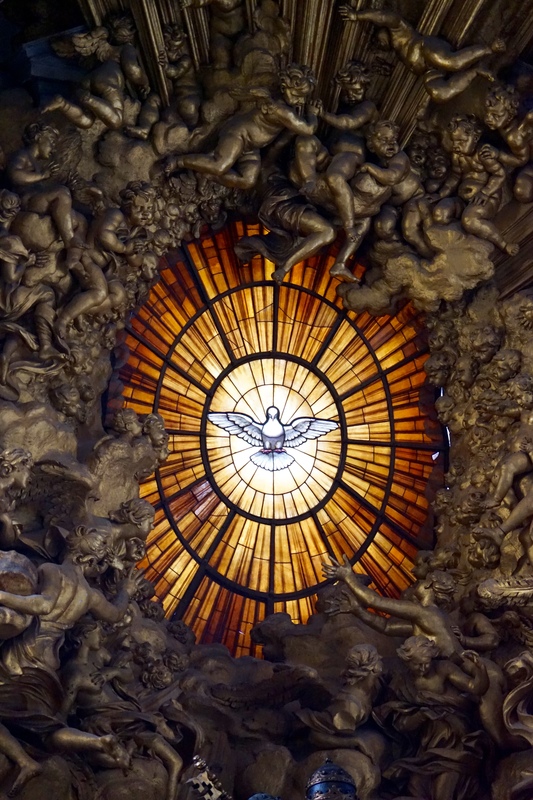 It is of a dove and we assumed it to be made out of stained glass, it is actually made out of a mosaic of incredibly thin pieces of alabaster marble that allow the light to pass through them. When the sun shines directly behind the window it almost takes on a 3D aspect and it seems as though the dove is coming right for you! 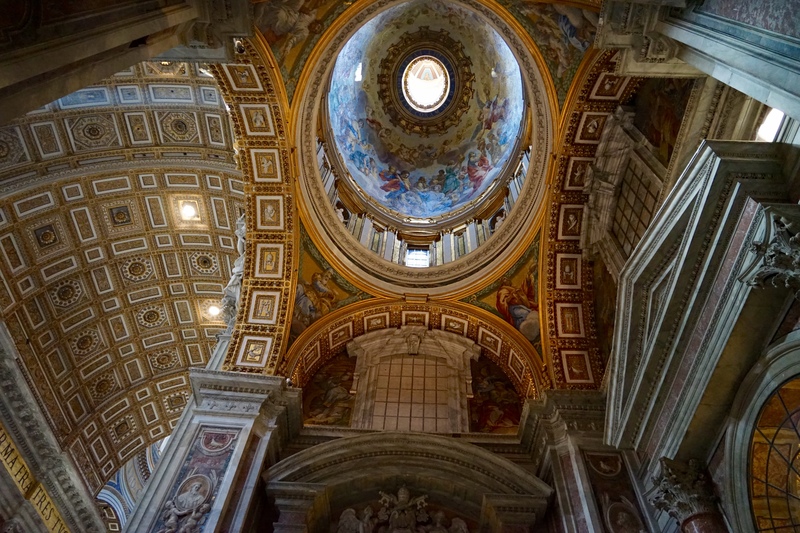 The climb to the top of the Basilica is one of the most insane experiences we have had in Italy. 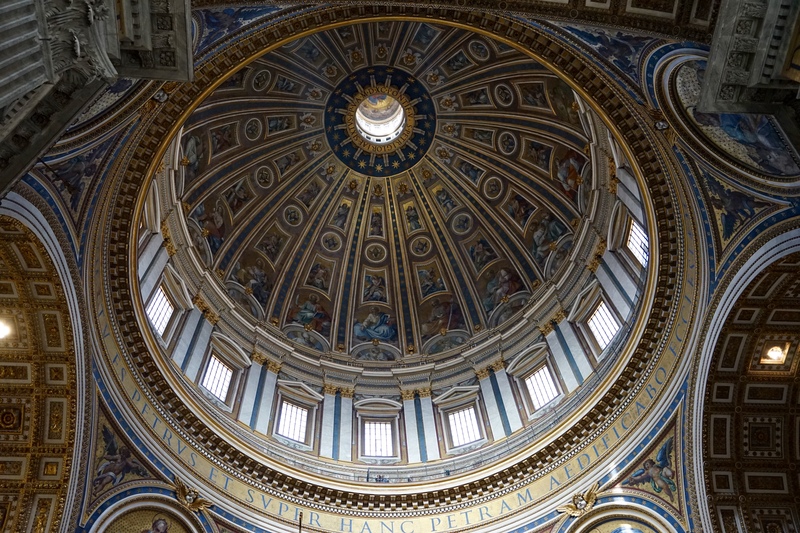 You go up spiral staircases that make you dizzy, walk around paths just inside the curvature of the dome that have you bent over sideways and go through passages so short and narrow I barely fit in. Once you finally make it up to the top though the views are incredible. 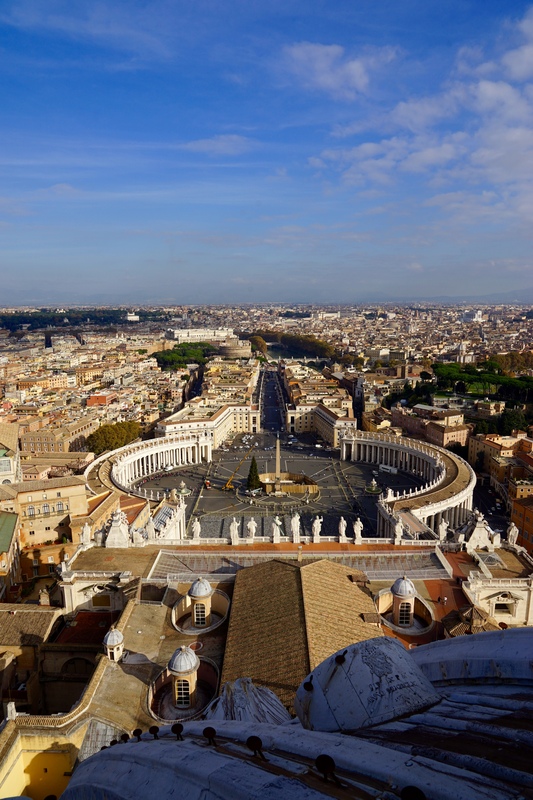 It is one of the highest points in Rome so the views of the city were great, its location means you get unrivalled panoramas of St Peter’s Square and the Vatican grounds as well. Definitely worth the climb but be prepared to be jostled by the selfie stick brigade. On the way down there is an opportunity to wander around on the roof of the church and buy some blessed holy relics if that’s what you are into.